The Glen Riddle Farm’s great two-year-old, Man o’ War, met with his first defeat here today in the running of the Sanford Memorial. He was forced to bow to Harry Payne Whitney’s Upset in a neck-and-neck finish in this six-furlong dash. Though defeated, Man o’ War was not discredited. On the contrary, the manner in which he ran this race stamped him, in the opinion of horsemen, as the best of his division without question. Though failing to get his nose in front, he stood out as the best horse in the race by a large margin, for he had all the worst of the racing luck. Beginning with a very bad start, he came on to give battle to a horse which had a start of three to four lengths on him. There was scarcely a witness of this race who did not believe after it was all over that Man o’ War would have walked home, with anything like a fair chance. For those who had hoped for a pretty race without anything to mar it, it was unfortunate that the acting starter, C.H. Pettingill, one of the placing judges, spent several minutes trying to get the horses lined up and then sent them away with only those near the rail ready for the start. The start was responsible for the defeat of Man o’ War, it turned out. Off almost last, Man o’ War gained his speed in a few strides and then started to pass horses all along the back stretch. Steadily Man o’ War drew up on Upset. On the last part of the turn into the stretch, Man o’ War took third position, about two lengths back of Upset. A few strides down the stretch Golden Broom suddenly gave up, and Upset ran past him. 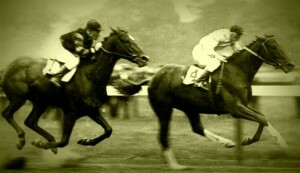 In another instant Man o’ War had dashed by his chestnut rival and it became a question whether Upset could last to win. Steadily Man o’ War drew up on Upset. A hundred feet from the wire he was three-fourths of a length away. At the wire he was a scant neck out of the first position and in another twenty feet he would have passed the Whitney horse. What made the race of Man o’ War so impressive was the fact that he came from so far behind and that also he conceded fifteen pounds to Upset. On the very performance of the two today the Whitney horse would not appear to have a chance to win under an even break. The Sanford Memorial, for which John Sanford donated a cup on this occasion because of the presence of Man o’ War and the widely heralded Golden Broom, who finished third, was by far the most interesting event that has been held during the Saratoga meeting. One of the largest crowds of the meeting, about 20,000 persons, saw the running of the race. Man o’ War, who beat Upset in their six previous meetings, never lost another race. He was retired to stud in 1920 and foaled 64 stakes winners, including the 1937 Triple Crown winner, War Admiral.